Help yourself to help others. I have always seen myself as an empath because I felt that I was sensitive to others feelings. I was just a sensitive period. I knew I wanted to help people in the latter, but also knew I was going to have to overcome many emotions and coping mechanisms. I have learned (and am still learning) the hard way that healing is not linear. There are going to be ups and downs where some days you feel like you are content and hopeful and other days where getting out of bed is a mental and emotional struggle. I then realized that I surely couldn't. Being in a profession that involves people battling with their own internal demons and improperly coping with them can be sometimes draining. I have so much help I want to offer but am I truly helping myself? I go through the motions of life by going to class, working, building my resume up, and attempting to stay healthy by working out etc. but I came to the conclusion that until I truly tap into my own toxic ways and the thoughts that hold me back from reaching my own potential I cannot be in that position to help others. I can give my everything physically, mentally and emotionally to others but how would I refill? Satisfying the ways of society by overindulging in social media, victuals and other unmeaningful substances will only fill temporarily. They would fill a void that would only keep opening up if it wasn't directly dealt with. I cannot say how many times I ran into people with greater energy. People that with one conversation can make your heart beat fast and make you feel more full in yourself. I aspire to be those types of people but felt I was limited with time and immaturity. I came to realizations that may help me get closer to having greater inner energy. Being aware is the most important aspect. Learning to be aware on where I direct my energy and how I react to other energy truly helps me to help others. Being aware of what content is presented to me whether in words, verbally, physically and emotionally and paying attention to detail and interpreting it in an effective manner helps to make sense and more importantly to have control. I am slowly learning that regaining control is important, even with the smaller things, such as paying attention to the inherent calmness of a grey sky, the detail in leaves outside of the window, the perfect gradient in the sky. To have this level of control and awareness helps to pay attention to detail in others. Empathy actually isn't just limited to other people when you think about it. It can be towards the environment and the animals in it. I have also learned that words are powerful. Other things I and her talked about were affirmations and perceptions. When I felt like I wasn't in a good place in life (financially, emotionally, etc. ), I made sure to tell myself that. I would purposefully limit myself and see myself as so much lesser than my potential. I remembered a time where Steve Harvey said "If you are going through hell, keep going. Why would you want to stay in hell?" As long as I kept telling myself that I was in hell and felt like I was never going to leave, I knew I was going to stay there. I learned I needed to see my struggles or confusing times in my life as a point of growth and taking risks, which aren't limited to any age. Furthermore being self-aware of how other's words are perceived as well. You can hear/see as a sense of course, but are you truly listening and manifesting? I learned that these are how things pass by and how blessings can honestly be missed. Speaking desires into existence is a driving force to want to make those desires reality. Not only should this apply to yourself but others too. If you see a loved one's potential, it is your job to want them to foster it, not just expect the outcome. Doing so can give them the confidence to pursue it. Being emphatic to others is the equivalent to being emphatic to yourself. Filling your cup so that you can help to fill others and maintain your fullness. Self-internalization and care are so much more important than simply volunteering and filling a role. Fill yourself with faith and allow yourself to build to that energy to be a light unto others. The basic ones are nice, but there's better ones out there, trust me. Let's face it. Life isn't as great as our perfectly-curated Instagram pics make it seem. I constantly need to remind myself to step back and breathe, and browsing through "Pinterest" for cute quotes is extremely cathartic to me. Sure, quotes like, "be brave" and "live, laugh, love" are great, but they've had their time to shine over and over again. Make room for some new quotes in your life. I think I enjoy browsing through quotes so much because it's a reminder that I'm not alone in whatever I'm going through because if there's a quote for it, it means a lot of other people have felt the same way. Sure, the cuter ones grab my attention, but that's the best part. I love seeing how artistic people can be with words, and I am always sure to save them or make them my background on my phone for constant motivation and a reminder that things will get better. Because we all need a reminder on why we started in the first place. Don't. Stop. It's always nice to know you have someone in your corner cheering you on. I remember the first time I read this because it really came at a time when I needed it. 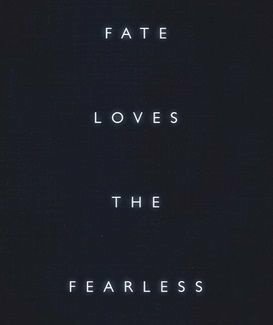 Don't be scared to take risks and be fearless because you never know which path it will put you on. There's no excuse to not find something you're grateful for in your life. There's always something, no matter how big or small, you can appreciate, and it's important to remind yourself of that. This is so powerful because it applies to so many situations. It's about growth, but can be interpreted in all kinds of ways, and I love it as I am figuring out what my future has in store for me. I'm a worrier and I like to have control over situations, so having this reminder to just chill out and let go is super important to me so I don't get stuck in the same old routine. With social media it's so easy to compare yourself to others, but it really does take the joy out of everything. You will never be happy if you're constantly comparing yourself to everyone else. This is great motivation for when you're trying to figure out what's next in life. Yes, I know this is approaching the "basic" category, but if you're as big of a fan of "The Vampire Diaries" and "The Originals" as I am, you know what this means, and I love the warm fuzzy feelings it gives me. It can also just be applied to any strong bonds you have with family and friends. I don't know about you, but I get the Sunday blues real bad, so this reminder to start the week off right is going to be a great thing to look back on every week. It's really easy to lose ourselves as we try out new things in life, but remembering who you are and where you came from really can change the game, and this is a great reminder to do just that. In a world full of deadlines and pressure to figure out what's next, it's easy to feel like you're constantly on a time crunch. I love this quote because it reminds you that there is time, and you can take as much of it as you want. For me, prayer is how I communicate with God, but it's also a form of self-reflection. I allow myself that time to say whatever I want, free of judgment, and I really allow myself to be completely honest. When you get stuck in a rut, it's easy to just stay there. This quote is a great motivator to figure out what you want and make it happen, and fulfill your calling in a way that is best for you.